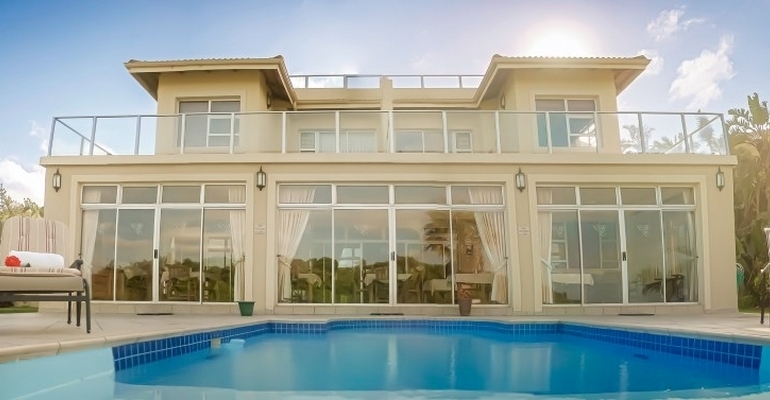 This luxury holiday beach house offers self-catering accommodation in the exclusive village of Southbroom on the South Coast of KwaZulu Natal. Positioned just above the beach, provides breathtaking views of the ocean. The Tuscan-style self-catering house offers spacious bedrooms with en-suite bathrooms and stunning panoramic views of the warm Indian Ocean from each private balcony and bedroom. The house’s decor is minimalist yet elegant, with earthy tones, natural wood finishes, pure cotton linen, king or twin beds and simple clean lines. The house has the full bouquet DSTV and is equipped with linen / towels / cutlery and crockery.